Polite reminder to potential eBay sellers of a Wild M20: The descriptions and photos below are specific to the author's example and should not be used in part or whole to sell an M20 online. Thank you. Wild of Heerbrugg, Switzerland have manufactured a number of designs of both low power stereo and high power compound microscopes. The latter were produced between 1940's-60's and the M20 was one of their later designs, which fortunately can still be found in good working order today, despite being over 40 yrs old. 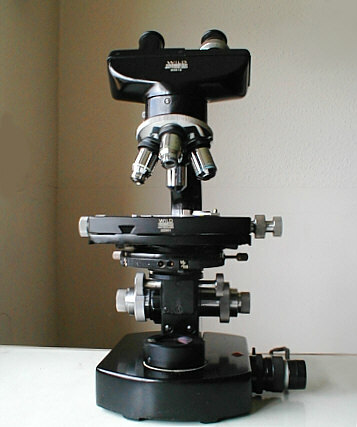 My M20, is a phase contrast version with a battery of achromat and fluorite objectives with standard binocular head and in-built electric lighting. The condition of the stand is very good considering its age. Only minor marks and small areas of oxidation are present on various parts of the body, and only some attention to lubrication was required, and cleaning. 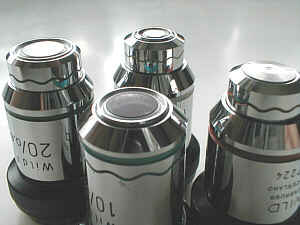 Optically, only the field lens has marks on its upper surface, and is fortunately of no consequence. All the objectives are as new, save for some minor marking on the bodies of two achromats, the boxed phase fluorite set with telescope was acquired separately, and complements the optical set-up perfectly. I think it is rather an elegant stand, which is larger than its graceful lines would indicate at first glance, and so its considerable weight came as no surprise. In keeping with the fashion of the day it was furnished in a very durable black finish, contrasting with chromed control knobs, objective changer and objectives. 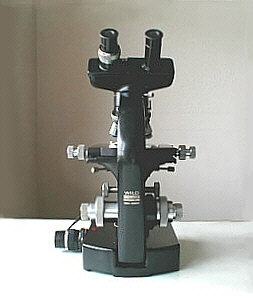 The limb, strongly constructed and carrying a well engineered rack and slide supporting the objective carrier and binocular head, is fairly heavy, and as the coarse focus acts through the lower limb, a concentric ring placed between the limb and inner coarse focus wheel has been designed to adjust the 'resistance or feel' of the latter. In use this provides smooth operation, but as a precaution during photography I have adjusted the limb stop in the base so that the limb rests upon this, with minor adjustments to focusing from the 'fine' focus control. 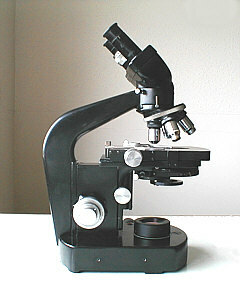 The latter, housed concentrically with the coarse focus activates the stage, and is very smooth, precise and dead pan. The objective changer is carried in a precise and positive ball bearing unit which has a dovetail slide to fit the upper limb, and can be adjusted for general optical aligning, as can the binocular head. The mechanical stage, being more than large enough to cope with all the work the amateur is likely to want of it, is admirably engineered and the observer is able to cover an area of approximately 3" x 2" ( 75mm x 50mm ) with consummate ease using coaxially mounted controls duplicated either side of the stage . The controls are situated at stage height which suits me since my former microscope was similar in this respect, leaving access to the substage controls uncluttered from both sides. The condition of the surface of the stage is remarkable considering the number of slide preparations that must have been placed there over the years, obviously indicating a very tough and durable surface finish. The slide clamp, a simple design, can be removed in seconds if need be by unscrewing one small knurled screw. 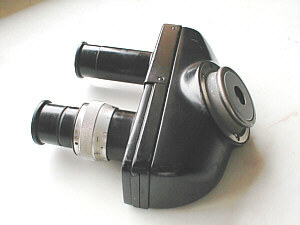 Machined body (made by the author) shown in place over the field lens which houses a large shutter for photography, but still allowing vertical condenser movements. The substage with rack and pinion control is nicely engineered, and bears the continental 39.5mm aperture ring for condensers, with 35mm filter tray. The iris lever on the condenser of the phase unit is not easily found during brightfield observation, a minor niggle of course, but more of a concern for me is the lack of adjustment to the condenser's axial positioning relative to the optical train. 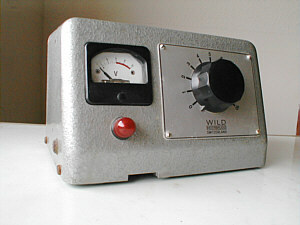 Though Wild have produced a beautifully engineered 'scope, some observers might wish to adjust the condenser in order to obtain special effects with the illumination. The substage condenser housing sometimes works too freely and tends to descend. This can be adjusted by simply gripping both of the knurled adjusting knobs and turning them in opposite directions. Turning them in a way identical to tightening a right hand nut and bolt causes the mechanism to become stiffer to operate, and of course visa versa. You may have to use some force to implement this. I believe the majority of M20's can be improved this way, but some appear to be devoid of this useful feature ? 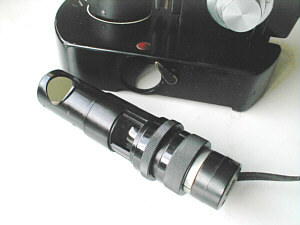 The field lens, loosely housed around a raised lip on the base, can be moved laterally to tweak the illumination when necessary, and is kept static by magnetism. 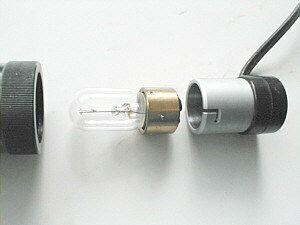 Thefoot, modest in size but neat and simple, houses the illumination source, a removable 12 volt unit. 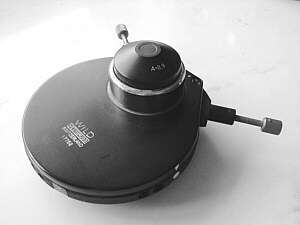 On first inspection, the protruding lamp housing looks a little out of place and awkward, but I like this self-contained unit because it can be easily adjusted whilst observing, and its field iris and lamp adjustments are still accessible when the unit is in place in the foot of the 'scope. This Kohler illumination design needs two mirrors to divert the light up through the field lens housed on the upper surface of the base; mirror number 2 is supported directly below the field lens. 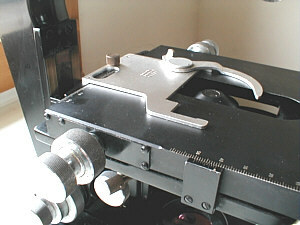 A simple eccentric locking cam holds the unit firmly in place after alignment. The bulb has a flat 'mwm' ribbon filament and is well constructed with a machined brass base with bayonet pins for locking precisely into its holder, which is held firmly in a collet type fitting by a ring seen above left, after optimising its position. Filament lamps get warm and this is a sensible place to put it, and as you can see above, the time taken to replace it would be about the same time taken to write this sentence, without using tools. Of course no matter how carefully designed and executed a stand is, it is only as good as its optics, and in this department Wild have demonstrated their skill in designing and manufacturing high quality optical components. The binocular head is a straightforward design employing the sliding of one prism/eyepiece tube to adjust inter-pupillary distance, and having the same eyepiece able to compensate for dioptric variations. This design requires that the inter-pupillary distance is first set, followed by the dioptric correction, which is of no consequence since most 'scopes are set up for one observer anyway. The phase contrast/condenser is of the Zernike type and provides easily adjustable ring apertures for x10, x20 , x40, and x100 phase objectives, and besides having a brightfield aperture, has a high power darkground stop suitable for up to x 40 objectives, which is also adjustable. The 0.9 NA condenser fulfils the needs of all the dry objectives in brightfield. 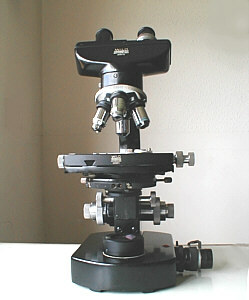 The objectives/eyepieces........Three achromats x4, x10, x 40 and four fluorites x10, x20, x40, x100 oil imm. ( phase ) and a pair of x10 compensating eyepieces complete the set. Apart from the x4 achromat which houses a simple doublet for routine searching, the objectives provide excellent imagery, and as you can see, the higher powers are spring mounted, and they are parfocal and parcentred too. I happen to have two x100 1.3 NA fluorite oil objectives, and whilst they were constructed quite a few years apart their parcentricity is very accurate, though the relative magnifications are understandably slightly different. The quality of the x40 0.65 NA achromat in particular is impressive, with a commendably flat field too and low secondary colour fringing, yet with useful depth of focus. The apertures of the fluorites are somewhat higher than the achromats, being 0.75 NA for the x40, 0.65 NA for the x20 and 0.4 NA for the x10. The images they produce are somewhat superior to the achromats, with a distinct absence of superfluous colour fringing, being as ever dependent upon the preparation, mountant medium and coverslip. As phase objectives their distinct ability to render minute protoplasmic detail, especially revealing the presence of countless bacteria, even with the x 10, let alone the higher powers, is a source of constant amazement, confirming that our microscopic world is indeed well populated ! The fluorite's leave vivid impressions of image quality in more obscure illumination set-ups such as with oblique and low power diffuse lighting, both in crisp detail and colour rendering. Close examination of photographs show that resolved detail easily exceeds the eye's capacity to cope, and although I do not possess higher power eyepieces than x10, I am confident that powers of up to x15 - x20 would yield imagery revealing more detail hitherto unoticed. The Wild M20, simply exudes quality, and is a privilege and great pleasure to use. This is an instrument designed and crafted with great care, during a period of post war austerity and before the advent of computers, and computer controlled machinery, in which human endeavour and skills alone achieved and maintained the necessarily high standards of craftsmanship. I shudder to think of what it would cost to produce today. 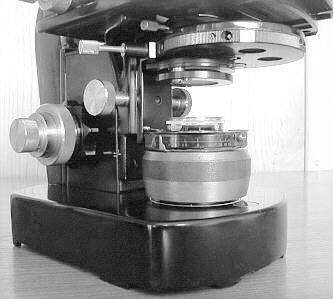 Any criticisms that I have made in this article arise from my personal quirks and methodology, and in no way reflect upon the engineering and optical skills used to construct this microscope. A brief history of Wild-Heerbrugg can be found on the Polymeca AG site. Comments welcomed to Paul James . 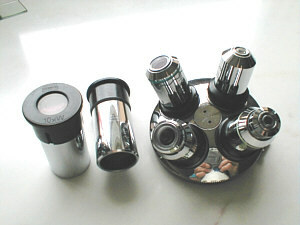 When the light goes out, temporary or permanent light sources/mounts when a specialist microscope bulb fails by Paul James, April 2003. Dealing with the Wild M20s broken gearbox. Plastic gear problems under the stage by Paul James, Mar 2005. 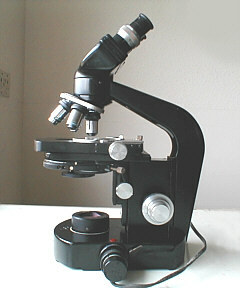 The Wild M20-EB microscope, an overview of a well regarded marque by Ian Walker, Dec 2005. Published in the August 2000 edition of Micscape Magazine.